MyBayCity.com The Greatest Pet Rescue Ever! The Greatest Pet Rescue Ever! Rescue Party Tour Presents Tom McPhee's An American Opera: The Greatest Pet Rescue Ever! Tuesday, July 7, 2009 at 7:00 PM. The Rescue Party Tour celebrates the human relationship with pets in our society by telling the story of the Greatest Pet Rescue Ever. This unique pet-centric event will benefit local and national animal charities and bring to light current issues as they relate to the economy. The Rescue Party Tour is pleased to present the multi-award winning documentary Tom McPhee's An American Opera: The Greatest Pet Rescue Ever!, a visceral, operatic vision of what happened to the pet owners of New Orleans who were forced to evacuate after Hurricane Katrina without their beloved pets, and the volunteers who came from all over the world to help. America suffered its worst domestic animal crisis in history when tens of thousands of animals were left to perish in neighborhoods all across the gulf. This heartfelt story follows the pets, vets, owners, officials, rescuers, and adopters of animals as they work through the chaos to do what is right, only to discover not everyone is working toward the same goal. Tickets are available at www.rescuepartytour.com. General admission are $10 advanced, $15 day of Show. The VIP reception will feature a meet and greet with the filmmaker Tom McPhee, tabling from local animal groups, a signed poster, and $10 of every VIP ticket will go back to local animal charities. 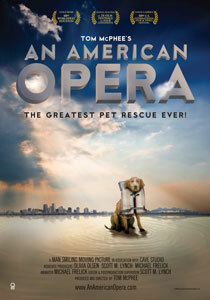 The screening of the multi-award winning documentary Tom McPhee's An American Opera: The Greatest Pet Rescue Ever! will be followed by a Q and A with the filmmaker.